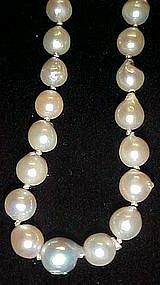 This lovely baroque (not perfectly round)style pearl necklace is hand knotted between each pearl. Measures 22" total length. Delicate sterling silver filigree clasp. Not sure if they are all natural or freshwater. but they re not plastic or faux. Nice weight.